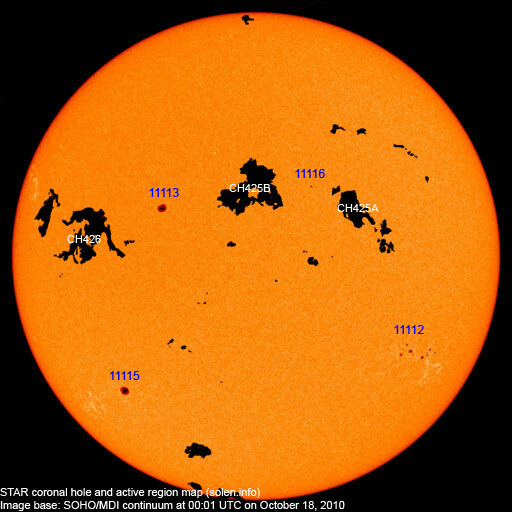 Last major update issued on October 18, 2010 at 04:00 UTC. The geomagnetic field was quiet to active on October 17. 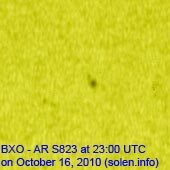 Solar wind speed ranged between 315 and 411 km/s. 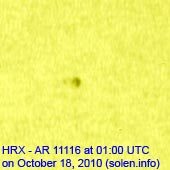 The CME effects that began on October 15 unexpectedly intensified after 06h UTC. 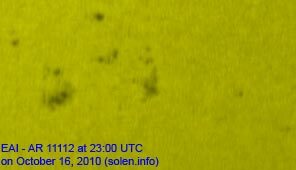 Solar flux measured at 20h UTC on 2.8 GHz was 83.6 (up 1.0 over the last solar rotation). The planetary A index was 11 (STAR Ap - based on the mean of three hour interval ap indices: 11.1). Three hour interval K indices: 23431023 (planetary), 23532122 (Boulder). Region 11112 lost several spots in the trailing spot section while gaining a few leader spots. 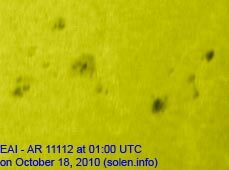 Flares: impulsive C1.7 at 08:59 and C1.6 at 17:39 UTC. 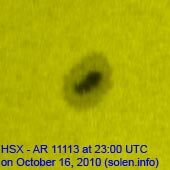 New region 11116 emerged on October 16 and was numbered the next day by NOAA/SWPC. The region developed early in the day, then decayed. October 15-17: No obviously Earth directed CMEs were seen in LASCO or STEREO images. 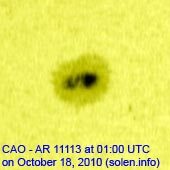 A recurrent coronal hole (CH425) in the northern hemisphere will rotate into an Earth facing position on October 15-18. 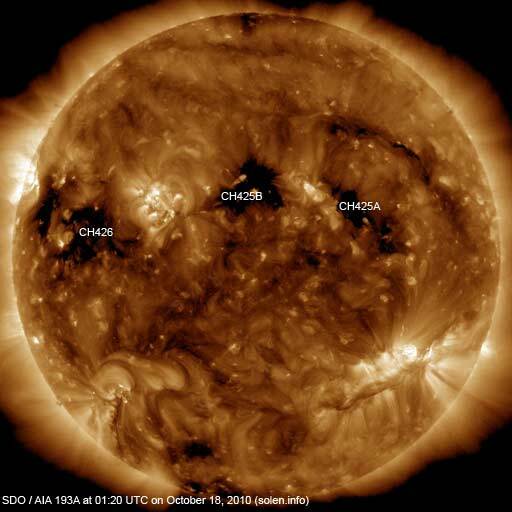 CH425 has decayed significantly over the last solar rotation (and split into two smaller parts CH425A and CH425B due to an active region emerging) and it is uncertain if the coronal hole will produce any geomagnetic disturbance this time. Another recurrent coronal hole (CH426) is currently rotating into view at the east limb. 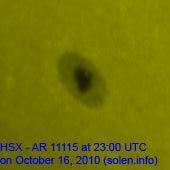 CH426 appears to have grown over the last solar rotation. 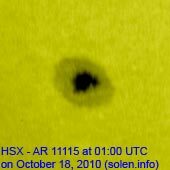 The geomagnetic field is expected to be quiet to unsettled on October 18-21, the first day because of CME effects, then due to weak coronal hole effects.